We carry out a research project entitled "Geological and geophysical data collection and analysis, offshore northeast Taiwan" during 2008 to 2011 funded by the Central Geological Survey, Ministry of Economic Affairs. This project aims to collect and analyze the existing marine geophysical and geological data off the coast of northern Taiwan. The published literature concerning the study area will also be reviewed and synthesized in this project to gain a better understanding of the geological framework and potential geological hazards off northern Taiwan. The collected data will be archived as tables or maps in a database for latter access. In each year, the geological structures and other sedimentary or geophysical features will be mapped out in forms similar to the 1 to 100 thousands-scale marine geological maps. 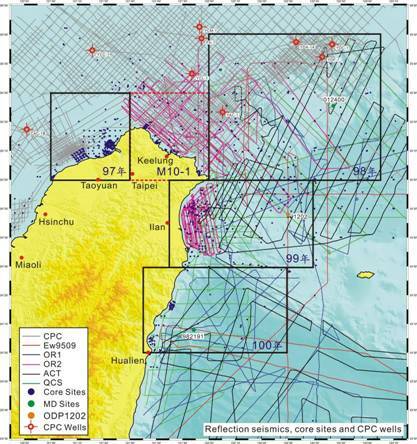 After reviewing and archiving all the existing geophysical and geological data, we hope to provide a reference frame for future data collection for full-scale marine geological mapping projects and to provide a synthesis for potential geological hazards off the coast of northern and northeastern Taiwan . For the past project period (16 September to 31 December 2008), we have completed a few catalogues for geological and geophysical data collected offshore northern Taiwan . We also synthesized all the available data offshore Danshui River and prepared maps showing seafloor-sediment distribution and geological structures for the top of the Nanchuang Formation. In the project year of 2009 we aim to synthesize all the existing geological and geophysical data in the areas of the Mienhuayu and the North Mienhua Canyon and prepare relevant geological maps. In addition, we continue to archive available geophysical data that were collected in early days especially for 3.5 kHz echo profiles and shallow seismic profiles. Here is a list of references in this study area. The Ilan Basin of northern Taiwan forms the western limit of the Okinawa Trough, where the trough meets the compressional ranges of central Taiwan. Apatite fission-track ages of 1.2 ± 0.5 Ma and 3.5 ± 0.5 Ma, measured north and south of the basin, respectively, indicate faster exhumation rates in the Hsuehshan Range to the north (> 1.6 mm /yr) than in the Backbone Range to the south ( 0.7 mm /yr). Reconstructed subsidence rates along the northern basin margin are also faster than in the south (6–7 compared with 3– 5 mm /yr). Global positioning system (GPS) and active seismological data indicate motion of the southern basin margin to the east and southeast. 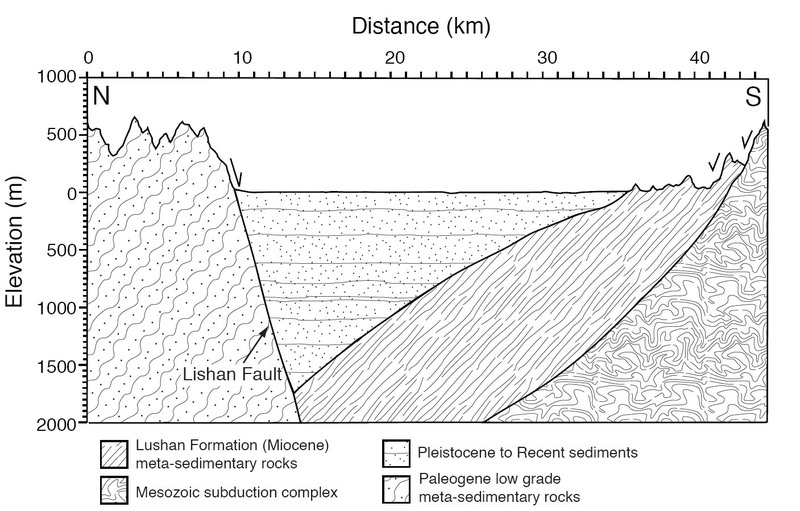 We propose that the Ilan Basin is being formed as a result of extension of northern Taiwan , largely controlled by a major southeast-dipping fault, modeled at ~30° dip, and mapped as a continuation of the Lishan Fault, a major thrust structure in the Central Ranges . Flexural rigidity of the lithosphere under the basin is low, with elastic thickness ~ 3 km . A southwest-migrating collision between the Luzon Arc and southern China , accompanied by subduction polarity reversal in the Ryukyu Trench, has allowed crustal blocks that were previously held in compression between the Eurasian and Philippine Sea plates to move trenchward as they reach the northern end of the collision zone. Subduction polarity reversal permits rapid extension and formation of the Ilan Basin and presumably, at least, the western Okinawa Trough, as a direct consequence of arc-continent collision, not because of independent trench rollback forces. This conceptual model suggests that migrating arc-continent collision causes the rapid formation of deep marginal basins that are then filled by detritus from the adjacent orogen, and that these should be common features in the geologic record (Clift et al., 2008; in Special Paper, Geological Society of America). Clift, P.D., Lin, A.T. , Carter, A., Wu, F., Draut, A.E., Lai, T.-H., Fei, L.-Y., Schouten, H., Teng, L.S. 2008. Post-collisional collapse in the wake of migrating arc-continent collision in the Ilan Basin, Taiwan . in Draut, A.E., Clift, P.D., Scholl, D.W. (eds) Formation and Applications of Sedimentary Record in Arc Collision Zones, Geological Society of America Special Papers, 436, 257-278, doi: 10.1130/2008.2436(12).